President William Craig Rice engineered Shimer College's controversial move to the IIT campus, but he's not hanging around to see how it works out. When I talked with Shimer College president William Craig Rice earlier this summer about how the venerable little school was doing after its first year as a tenant on the IIT campus, he said he was looking forward to the fall of 2008. Last August, at Rice's urging, Shimer made a controversial move from its cozy cluster of vintage buildings (all but one homes) in Waukegan to the stern Miesian campus on the south side. It's now a radical pocket tucked into the larger school--its beloved campus traded for the second floor and a main-floor entry at 3424 S. State, in one of IIT's beige bunkers. Shimer, where students read and talk their way through a Great Books curriculum, made the move in an effort to goose enrollment, which Rice says has been stuck at about 100 for the last 15 years or so. 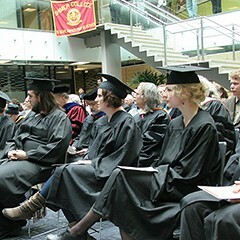 But instead of bumping up last year the Shimer student body dropped 25 percent. And things weren't looking any better for this year: Shimer--which accepts serious students without a high school diploma and charges about $22,000 for tuition--had signed up a grand total of 75 undergraduates. Rice said this small number must be transitional and pushed the date for the expected growth spurt ahead to the 2008-'09 school year. Then, last week, just before the start of the fall term, he announced that he'll be splitting in September to take a job with the National Endowment for the Humanities. But a mere placeholder president could be dangerous at such a delicate juncture. And Shimer's such an odd duck that it's unlikely the Registry's candidates would have had experience anyplace comparable. Shimer's history, recounted in a 1988 Reader story by Harold Henderson, goes like this: Founded in 1853 as the Mount Carroll Seminary, it was purchased two years later by its head, Frances Wood. It changed to a women's school in 1866, then 30 years later became the Frances Wood Shimer Academy of the University of Chicago--a traditional prep school and junior college for women, under the supervision of the U. of C. The biggest change came in 1950, when it was transformed into a true U. of C. outpost: a four-year coed college devoted to Robert Maynard Hutchins's Great Books curriculum. 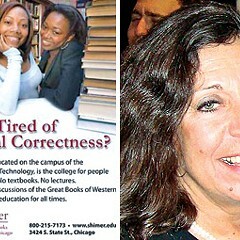 The formal U. of C. connection was dropped just eight years later, but Shimer hung on to both the Great Books curriculum and an enhanced academic reputation. By the mid-1960s, with enrollment at more than 500, the school had taken on debt to expand its physical plant. Then--at the school's apex--the faculty went to war with one another over issues too obscure to recall even 20 years later, when Henderson wrote. Enrollment began a long decline, and by the late 70s Shimer was bankrupt. In 1979 the Mount Carroll buildings were sold, and the small remaining faculty moved the school to Waukegan. Money's always been scarce. Henderson recounts how Wood allegedly handled a sizable school debt back in 1857: she married the creditor, Henry Shimer. Over the years the employees have made numerous sacrifices to keep the place going. For two decades, beginning at the time of the bankruptcy, the school had a single salary policy whereby the janitor--if there'd been one--would have been paid as much as the president. That policy began to erode when they brought in a CFO in 2001, but even today new teachers, no matter what their experience, start at the same salary, and almost all of the dozen faculty members also perform administrative functions. Professors also jump the usual boundaries to teach across the core curriculum of humanities, social sciences, and natural sciences. The physical anchors for the program are the specially designed octagonal tables that were moved from Waukegan, where students in classes of no more than 12 gather to consider the primary documents of Western civilization starting with Plato. Shimer claims that by having students engage directly with the sources rather than predigested textbooks, it teaches not what to think but how to think. It's not surprising, then, that when Rice proposed the move a couple years ago, students and former students thought deeply about it. On a Shimer blog they debated whether the school would be able to keep its identity and sense of community when students were no longer living together on their own turf. They worried at length about what it would be like to be tenants on a big campus that some perceived as alien--cold and technocratic, in a possibly dangerous neighborhood. Shimer grad Sarah Kimmel, a corporate training consultant, says the worst fears haven't materialized: "The community seems to be retaining its identity," and "many of the people who had doubts are now hopeful" about the school's future. She adds, however, that Rice's departure is an unexpected disappointment: "We thought his commitment to the school was greater than that." Rice was hired in 2004; previous president Don Moon, who's still on the faculty, served 26 years. Rice says he wasn't "out looking for a job" when the NEH offered one he couldn't refuse: he'll be heading up its education division, overseeing grants to schools, colleges, and universities. (He says he'd have to recuse himself in regard to Shimer, but others surmise his new gig can't be bad for the school.) All but one of the dozen Waukegan buildings have been sold (for a total of about $2 million); when the last one goes, the school will be free of long-term debt. Meanwhile, though a planned all-years reunion this month was canceled largely because of a disappointing response, fund-raising is booming, relatively speaking. Rice says Shimer raised $1.2 million last year--a 400 percent increase over the average of the three preceding years. (According to other sources, the boost in donations was imperative because it's more expensive to operate at IIT than it was in Waukegan.) The current budget is about $2.75 million. Rice says the move has also given Shimer a leg up on recruiting: its students now get access to IIT's facilities and services and the option of registering for IIT classes, making it "the best of both" a Great Books school and a great technical institution. Even if they're not yet storming the place, he says inquiries from prospective students have jumped. A Shimer spokesman says the school got an average of 500 inquiries a year in Waukegan, and has gotten about 2,000 already for 2008-'09. Rice is convinced that "the move is being vindicated." He just won't be around when the real evidence comes in. Art accompanying story in printed newspaper (not available in this archive): William Craig Rice photo by A. Jackson.